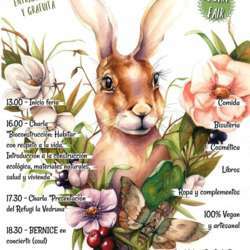 You must be a member of the Barcelona Vegans and Vegetarians Group to attend this activity. Would you like to join this group? The monthly vegan fair is coming again, let’s go have a great time eating delicious homemade cheap&healthy food or having a look around at other things that you can be interested in there like costume jewellery, natural cosmetics... books, screenprinted T-shirts and fabric bags, accessories..
At 4.00pm Conference:"ORGANIC BUILDING. An introduction to eco-building, natural materials, housing and health issues by the DE MANS A TERRA architecture collective. At 5.30pm presentation of LA VEDRUNA animal sanctuary. At 6.30pm Soul concert with BERNICE. We will meet 14:00pm at the front door, but don’t worry If you come late, you can catch us inside.